Get ready to be addicted by this new puzzle/match 3 game that was released on the Android platform not too long ago. 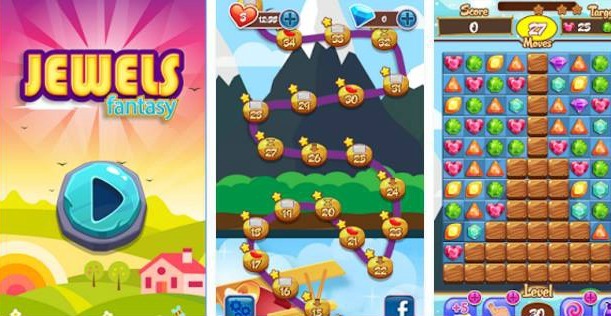 From our personal experience, we can tell that Jewels Spring: Star Fantasy is one of the most fun games that can relax you and challenge you at the same time. Full with colorful and pleasing backgrounds and interesting sound effects, this game make your free time more enjoyable, for sure. Besides, it can be played on both Android phones and tablets. The gameplay of the Jewels Spring: Star Fantasy game is simple, yet so challenging and addictive. Unlike other jewels match games, this one has more challenging modes. If you download it, you will be able to play through more than 100 levels, all with increasing difficulty. Your mission is to win Jewels Royale Saga by winning as many levels as you can. Swap the jewels on your screen and match at least 3 in a line to crush. Resolve the puzzles and eliminate all of the jewels, get bonus scores if you do it quickly and use the helpful power-ups. With beautiful spring backgrounds and animated visuals, you will have the chance to become the jewels quest hero. Download the game today, it is free on Google Play and share it with your loved ones.